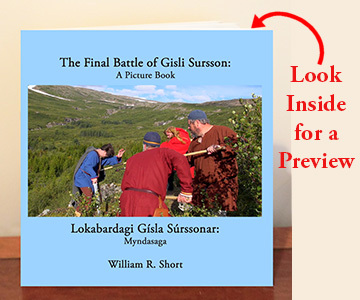 Never before have the Viking-age sagas been brought to life as clearly and as vividly as in Hurstwic's new book, The Final Battle of Gisli Sursson / Lokabardagi Gísla Súrsson. The story is told in Gísla saga, one of the best-known and most-beloved of the Sagas of Icelanders. The saga tells of the life of Gísli, a valiant man whose luck sometimes deserted him. In his final battle, he faced single-handedly fifteen armed men and battled them to his death. The book uses brilliant color photographs, which were shot on location in the actual place where the historical battle occurred over 1000 years ago. Authentic costumes, weapons, and fighting moves were used to recreate the battle in exquisite detail. The saga text is provided in both the Icelandic original and in English translation. Regardless of your interest, whether it be the Viking-age topics, or Viking fighting, or the sagas as literary works, or you just love a good story, you will find something of interest in this unique book. Order the book directly from Lulu, a print-on-demand service. Or, order the book from your favorite book seller or on-line bookstore. Look inside the book for a preview. 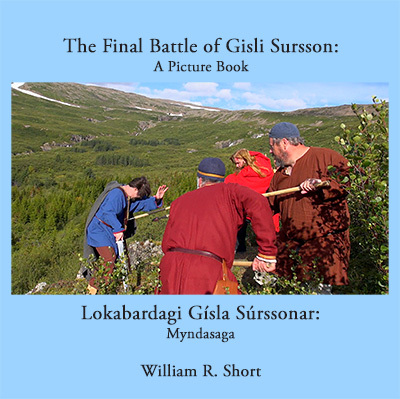 Also please look at our DVD, The Final Battle of Gísli Súrsson.